The Vision Board is Older Than History! Yes, I am a student of personal development, but my first field of study was actually ancient history and archaeology. I am often amazed how so many of our current and “modern” cultural tendencies have their roots in the oldest cultures. Recently, while working on a new vision board project (that I will be sharing here soon) I was struck with a sudden insight. Vision boards are nothing new. As a mater of fact, vision boards are some of the oldest cultural artifacts we have! That’s right. 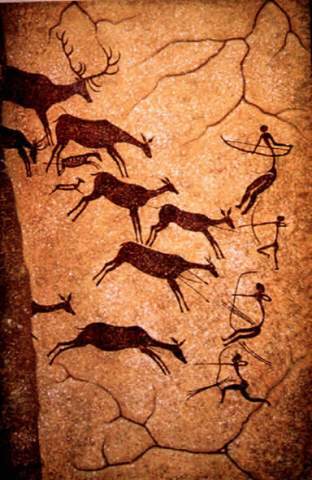 The earliest records of our species were cave paintings like the one seen here, found in Lascaux, France. What we see here is a vision board. It shows, very clearly, the goals of the artist and a very positive outcome . We see the artist/ hunter represented. We also see the goals he has set for himself (a good hunt). Finally we see the positive energy that the artist has put into his Paleo Vision Board. The animals are filled with arrows, indicating a successful hunt for all. If that’s not a vision board in form and function, I don’t know what is. In addition, archaeologist have determined that the artists probably didn’t simply wander into a convenient cave and doodle a sketch on the wall. The cave was set aside as a sacred space and the drawings were done with great ritual and emotional outpouring. They put a great deal of feeling and energy into both the creation of this artwork and the goals that this drawing was to help bring about! In every way this is identical to the process that we use today to create the most potent vision boards. When you make your next vision board, take a lesson from the people who’s very survival depended on the outcome of their vision board. Find a place to work that has good energy. Put strong, positive emotions behind your images, and hold the finish product in high regard. It’s not just arts and crafts. It’s a power tool and should be handled with respect. This is a post I’ve been meaning to do for quite some time as a matter of fact it was a little phone. I wanted to see how that is the Dragon NaturallySpeaking app was on my iPhone. So my plan was to simply speak a post. I have minimal training with Dragon NaturallySpeaking. I can in Decendents. I can start a new paragraph. the point of this post is just to illustrate how accurate this app can be iPhone for getting your ideas out there. I do not contingent at it, touch, or fix anything in this post. I’m just going to speak it and posted. However any interest legibility I think I might have to type up the transcript of this and post it directly under it. That way you can see what I intended to say versus what dragon that. Actually recording. If this works. It’s a fabulous tool for getting your ideas out. I do most of my good thinking in the car and there’s really no way from you right all I’m driving. This way I can do rough drafts of posts, chapters and e-books, grocery list or anything else that pops into my head well I’m on a particularly dull stretch of road. I just look at that last line and it didn’t record that very well. That last bit was a totally unedited entry from my iPhone and the Dragon Naturally Speaking app. I guess its not quite as polished as I would like it to be but still, its pretty amazing for a free app. I used a set of ear buds with a microphone and it picked up the gist of what I was saying even if it didn’t transcribe it perfectly. 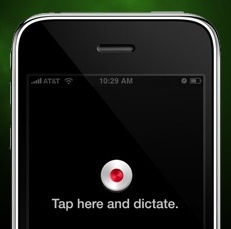 The app allows around 20 seconds of recording before it cuts you off and transcribes what you just said. Never fear, though, when its finished its transcription you just hit the record button and it picks up right were you left off. I haven’t found an upper limit to the amount of dictation it can take in this manner. I love this app because I get most of my best ideas while I am driving in my car. This way I can capture the idea and send it to an email to myself. I also seem to think better when I am walking so I can totally see using this as I walk around my neighborhood, getting my blogs roughed out, and getting a head start on chapters in up coming books, or even reminiscing for my journal. All of this text can be emailed from my phone and stored in my inbox to be copied, pasted and edited. As you can see the transcription is far from perfect, but it is great for a VERY rough draft. It goes a long way to getting you started on any writing project. Sometimes facing that blank page is the first, biggest hurdle to getting a project done. This way you have something to start with. Problem solved. I’ve always heard that “writing is re-writing anyway. I fully intend to get better with this app. The opportunities seem enormous. I think that they designed the app to learn as you use it so the I expect the transcriptions to get better over time. This is a post I’ve been meaning to do for quite some time. As a matter of fact it was a little fun. 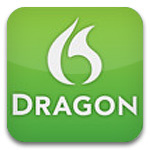 I wanted to see how that is the Dragon NaturallySpeaking app was on my iPhone, so my plan was to simply speak a post. I have minimal training with Dragon NaturallySpeaking. I can end sentences. the point of this post is just to illustrate how accurate this app can be for getting your ideas out there. I do not correct, edit, touch, or fix anything in this post. I’m just going to speak it and post it. However, in the interest of legibility I think I might have to type up the transcript of this and post it directly under it. That way you can see what I intended to say versus what dragon was actually recording. If this works. It’s a fabulous tool for getting your ideas out. I do most of my good thinking in the car and there’s really no way for me to write while I’m driving. This way I can do rough drafts of posts, chapters and e-books, grocery list or anything else that pops into my head while I’m on a particularly dull stretch of road. I just look at that last line and it didn’t record very well. Typing lets me edit on the go. Speaking doesn’t let me do that so I only use the 20 seconds for maybe a paragraph. Anyway that’s how it works. I will post for my next post because driving and talking isn’t natural to me yet transcript will see you later. The bits marked in red are parts I can’t figure out. I cant remember what I was thinking. Use earbuds with a mic. That way you can see when you are out of time and push the record button again. Besides if you are driving it makes it much easier all around. Speak naturally. If you slow down it actually confuses the app. Some very smart people went to a lot of trouble to make it easy to use. Stilted speech also leads to stilted thinking. Edit you text as soon as you can. While it is still HOT in your head. The colder it gets the more difficult it will be to remember what you wanted to say.